Quantum entanglement, a condition in which the states of two different objects become so inextricably linked that neither can be described separately, is an essential element of any future quantum computer. Scientists have succeeded in entangling many sorts of entities, typically identical atom or photon systems. But it has never been accomplished between an atomic system and a solid-state system such as a quantum dot in a semiconductor microcavity. 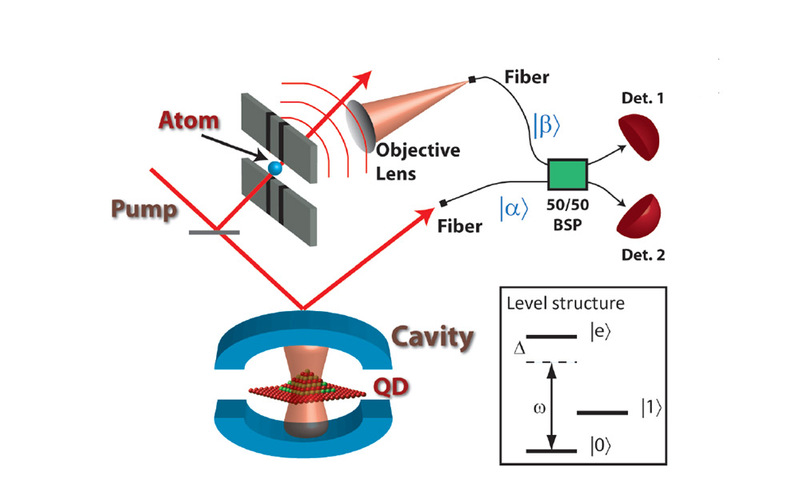 Now two researchers have devised an experiment in which the quantum state of a single trapped atom will be entangled with that of a quantum dot through the intervention of a laser beam that serves as an interface between the two. This is a difficult challenge, because each object radiates light of substantially different characteristics. Such a hybrid entanglement would be able to exploit the particular advantages of each component: Atoms can sustain delicate quantum states for a very long time, whereas quantum dots can interact rapidly and strongly with light.